Overall, seems to me De Blasio & Farina have rolled out some pretty solid stuff when you look at it as a whole, minus the politics. I think the district restructuring is a mixed bag and the top-down management is problematic, but the smooth roll-out of pre-K services, and Single Shepherd and AP and College Access programs will be gamechangers for kids in the long run. Where we need to keep pushing De Blasio and Farina: autonomy and accountability for school leaders, reducing partisanship over charters and choice, and fighting segregation. There’s always plenty to criticize in any Mayor or Chancellor’s reign. I’ve gotten into frequent arguments with my colleagues about Bloomberg and Klein’s administration because I’m unwilling to paint their leadership and policies with one broad stroke of good/bad. Let’s talk about what is working and criticize what’s not. David Cantor at the 74 has insightful analysis of NY politics and how it’s affecting the Mayoral Control debate–and the way we talk about education. He’s right. This is one of the fundamental problems with how we look at education. If we are only focused on the short-term, then all we will get is short-term effects, which may ultimately be detrimental. Here’s a case in point. Due to the outsized focus on test scores in elementary schools, many principals place their most effective teachers in the 3rd grade or higher, because that’s the grades that are tested. But a far better strategy, in the long-term, would be to place your hard-hitters in the earliest grades, because that investment will better build the foundations for learning that many kids desperately need. Similarly, principals talk about focusing all their attention and resources on their “pushables”–the kids who are at the upper borders of a 1 or 2 or 3 on the state test. So what’s going to happen to the students that aren’t so labeled? And what’s going to happen to the coherence in your instruction across your school? There may be something more: apathy. Not his; ours. Fixing schools is difficult work; it’s slow; you lose people’s attention. “People are more concerned about the subways,” said Weisberg. Indeed. The real work of education is incremental, it’s hard, and it won’t grab many headlines. Indeed. It’s hard to make any single statement that accurately characterizes schools period. This is one of the core issues about how we talk about schools, whether public, charter, or private. What does “optimizing” our public institutions and services mean? “Cook, the Apple CEO, requested that computer coding be taught in every public school. Microsoft CEO Satya Nadella said workers need more skills for a technology-based economy. Amazon founder Jeff Bezos encouraged the government to use commercial technology to save money and develop artificial intelligence to improve government services. In other words, use public institutions to serve private interests. Hmm. What does serving public interests mean again now? I wish more folks understood that education is a public good. This is the last full week of school for NYC student and teachers. Congrats to graduates and to their teachers. This is also the last week of the NY legislative season. The kerfuffle is over mayoral control of NYC schools. Lost in the kerfuffle is legislative action on segregation. One of my biggest criticisms of Success Academy’s Eva Moskowitz has been that she makes a big deal about terming her schools “public” schools, yet keeps her curriculum private. Now I can’t level that criticism any longer. She has released some of SA’s curriculum, with more to come. Right now there’s only K – 4. It’s also important to note that this material is not openly licensed. Robert Pondiscio suggests that the strength of SA’s curriculum is that it’s based around rich knowledge and texts. 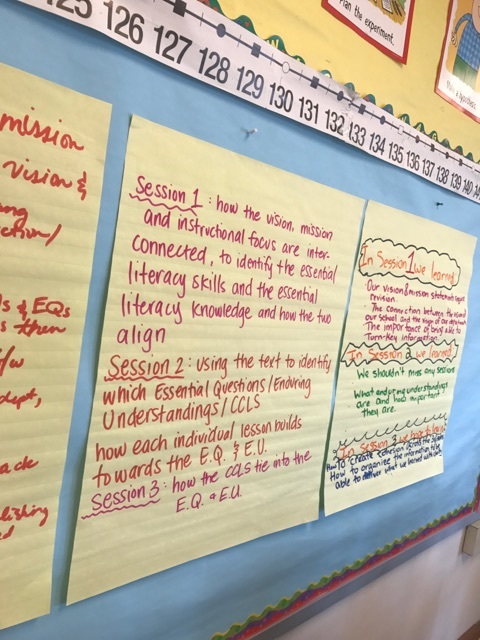 Though from my (admittedly cursory) glance at a unit, SA literacy looks pretty darn similar to the “balanced literacy” approach that has been utilized for years across NYC. So what’s the difference? There are firm guidelines for how a classroom must look and the practices that accompany the curriculum. And the units do seem to be firmly oriented around text sets that can build knowledge. To my mind, the key differentiator in SA’s favor here is coherency and consistency. In his new seat at Chalkbeat, Matt Barnum compiles a useful list of questions that need to be asked about charter school for further research. My guess is this is because a CMO provides greater knowledge sharing and network effects. He also has some good advice for NEA and AFT union heads worth heeding. NYSUT, unsurprisingly, heralded the NY Board of Regent’s recent move to limit testing from 3 days to 2. So. . . All kids should get an achievement award! Woohoo! Healthier lunches don’t decrease obesity–but they increase test scores!